Antique China and Fine China is Great, But What About My Fosters Pottery? Antique China and Fine China is Great, But What About My Fosters Pottery?. I collect FOSTERS STUDIO POTTERY, OF REDRUTH, CORNWALL, ENGLAND and I think you should list it as it is very popular online in the auctions and fetches very good prices. Maybe I was looking in the wrong place, but I couldn't find it anywhere on your lovely site. The pattern they specialise in is a Homeycomb type of glaze. I collect the brown, they also do a dark brown and a mint green. I collect this lovely ware, but I don't know too much about the company, so could you possibly give me a little background please? Thanks for your contribution to this Antique China and Fine China page. I could not find an entry about Fosters in any of my encyclopedias, because I found out by following the system shown on my China Replacement page that it is a very small local Redruth West Country pottery - selling the distinctive Honeycombe tea service wares. Comments for Antique China and Fine China is Great, But What About My Fosters Pottery? Antique China and Fine China - Fosters Query. Thanks to Debbie for flagging up her Fosters Pottery collection. I started my collection when I bought a boxed lot at auction. To my surprise, at the bottom there was a complete collection of Fosters Pottery which since then I have been steadily building up over the past few years. My step daughter recently gave me a toast rack for my birthday which really touched me. I don't know where she found it or even that they did toast racks. It's now my favorite piece in the whole collection. Thanks for your site - it is very interesting. I collect Fosters pottery too. I can give maybe a little bit more background. Fosters pottery used to be based in Redruth in Cornwall and was set up by the Foster brothers I think in the 1960's. Reg Foster then went his own way and set up Kernewek pottery, based in Goonhavern (just outside Perranporth). Kernewek pottery closed a few years ago and I'm pretty sure Fosters went about 10 years ago now. It was big in Cornwall when I was growing up (70's/80's) and I've started collecting it as it reminds me of long lost Christmases with the family. It might not be Royal Doulton but I love it! Thanks for this extra bit of information on Fosters. I agree with you when you say "It might not be Royal Doulton, but I love it". A couple of years ago, my hubby and I went to visit the address to see if we could find the pottery (there were still the brown tourist signs giving directions to the factory). We asked around and finally found a tiny pottery unit which was shut because it was the weekend, but there was signs of activity and shapes stacked up which looked like Fosters shapes. We wrote down a number on the outside and took photos of me outside. We later phoned the number and someone said that Fosters was indeed still making stuff and open for business. We didn't really follow up any more than that, but if you go to Stoke-on -Trent, you will find still lots of little fine china makers tucked away still beavering away and mainly making for other people. Maybe this is what Fosters do now. Do you know if Fosters ever made a Seal shaped gurgle jug similar to their fish shaped jugs? I came across one at an antique shop in cobalt blue glaze that looks very similar to the seal figurines and honeycomb pattern, but it was a jug. Any info would be appreciated. Thanks. Gurgle Jug - Fosters Pottery? Hi there, I belive that the jug you are mentioning is possibly Poole rather than Fosters - do a search and I think you might find your answer. Poole pottery didn't always mark the underside. Just to let you know I'm the grand daughter of Michael Foster, one of the original founders of this pottery. I find it quite sad that there's not more information about the pottery. Unfortunately the business went bust quite a long time ago. My grandfather still makes hand made pottery and now owns a much smaller business. I'm setting up a website for all his work and was wondering if any of you could send me photos of your collections so I can piece it all together! Amy, I don't know if this is too late to be helpful, but there are certainly seal gurgle jugs by Kernewek pottery, and you'll see from the info provided by someone else here that this is like an offshoot of Fosters. The style looks similar. I was wondering how much a fosters coffee set is worth(coffee pot with lid,milk and sugar bowl,six mugs and six saucers)brown honeycombe pattern,absolutely in mint condition,never been used(been in a box since the eighties)Thought I'd check before taking it to a boot fair. Phil, there's a lot of it on eBay so you could check there to see the kinds of prices that various separate pieces or complete sets are fetching. http://t.co/ipGfHB2 there is a picture showing both the smaller seal in blue and brown drip ware. I collect Fosters and too. Charity shops and boot sales are good for picking up bits. I even find it at antiques fairs, often in the cheap mixed boxes. It never will have much value, too much of it made but its nice! Someone has one for sale on ebay - they might be able to tell you more about it. I have a figureine in brown and cream called Bal Maiden. How common are these and what is it worth please. I have collected Fosters.for 32 years.I know the potter very well.He still makes the honeycomb and you can order it by phone if he still has the moulds.He now also makes small amounts of 'a celebration of Troika" which is a relaunch of Troika .This can be purchased in St Ives,very beautiful too. The potter now works on his own after the sad passing of his assistant,but i am sure he would be pleased to help. 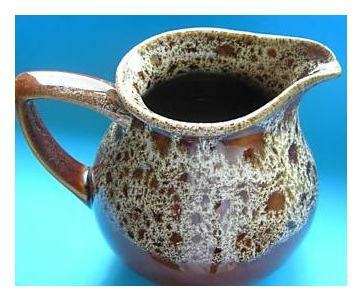 I have some nice items of this Cornish pottery,have a pair of brown seal gurgle jugs. I'm looking to sell all my collection if any body is interested,can supply list and pics. All good quality,need to sell to get my motor bike repaird,more expensive than I thought. Coffee pot set,six cups and saucers,sugar bowl,milk jug. Other style coffee pot,tea pot,owl spoon rest,small vase,four seals various sizes.....lot more to see. Email if interested,and I can send pictures. Glad to see there are other crazy Fosters collectors out there. I now have a collection of over 500 honeycomb pieces,in brown, light brown,green and the lovely blue made by kernowek. I do not know why I collect it, it has no value, but am unable to resist if I see a piece I have not got at a boot sale or charity shop. We use things like the storage jars, and I would use the plates etc, but do not think they are dishwasher/microwave proof. I feel quite sad to think it will probably end up at the dump someday when the children clear out their parent junk when we are gone! Fosters Pottery started up in the late 50s - early 60s. The original pottery factory was at West Tolgus next to Redruth School Technology college near the old A30 between Sara's Foundary and Barncoose Roundabout. The new Tesco superstore filling station is now slap bang on the orignal site. I think it was in 1994 it closed and the pottery moved to Wilson Way Ind Est,Illogan Highway off Trevenson Rd. Ian Moore a Hampshire business man with an already established company in Cornwall rescued Fosters Pottery in 1994. Fosters at its height employed fifty workers and was synonymous with reactiveglaze effects for fourty years, was now for the first time to trade outside the family infuence. To begin with Fosters supplied Mr Moores impressive retail shop " Tescan Ltd " With ornimental and domestic ware, however in 2004 it was decided to close the shop and rent out the site. My Family move to Redruth/Camborne Area in the 60s, we visited on regular basis and collected most of the Dark Green Pottery and had extra which was bought for us as wedding presents 30 years ago, it is used every day and Wendy it all goes in the dish washer. So hard wearing and the colour has stayed. we have lost a few bits over the years, imagine my joy of holidaying in Scotland and finding a treasured milk jug (which got broken)in Fort William charity shop with 2 soup dishes and plates. When I went to pay I thought it was for each item only to be told it was for all 5 items, so I gave them extra it was such a find. FOSTERS POTTERY Long may it last. Erika look forward to reading your history. Just a note from me to say I am loving this thread, and all your individual stories, and your love of Fosters (it may have been the first one posted, but I can't remember that far back). This is one of the oldest threads on this site, and it is just like a good wine, it is maturing beautifully. Okay, and it's time for me to fess up. The Debbie who posted the original contribution is my wife, and she still loves her treasured Foster's pottery collection. Keep the Fosters stories coming folks! Hi, I have about approximately 50 Pieces of Fosters pottery for sale. brown honeycomb, coffee pot, biscuit barrel, a couple of seals, plates, cereal bowls, salt & pepper pots, cups & saucers etc. please We have decided to use my vast collection but need a few more of the above! What do the Fosters numbers mean? My gluggle fish has Fosters Pottery Cornwall England 1 on the bottom. What does the 1 stand for? I seem to remember reading somewhere about different Studios maybe 1 and 2?? I have a large collection of Fosters and Kernewek which I am intending to put on ebay over the bank holiday weekend. If anyone would like to make me an offer, please email me at [email protected] for further details, photos etc. I live in the midlands. Collect only, I'm afraid. I have over 200 beautiful pieces of the above, teapots, coffee jug, mugs, cups & saucers, turine, soup bowls, animals, twin egg cups, vases etc. Email [email protected] Open to offers. I have a full dinner set of the brown Fosters in the garage. It still has the stickers on. Never used. I'm selling on behalf of my mother a very nice complete 15 piece Fosters pottery coffee set in dark green. Tall coffee pot with lid, 6 cups and saucers, sugar bowl and milk jug. Very good condition, I suspect never used. I thought I'd try this site before eBay . Can send pics if required. So maybe when us collectors are long gone it might one day be worth a bit. Meanwhile we now use ours and its seems fine in the dishwasher and oven. And since I now have over 500 bits we are not short of spares! I bought a Honeycomb Kitchen utensil pot in a Charity shop about a month ago (August 2017). It was very greasy and mucky, but i could see the pottery was beautiful - it just needed a good old soak in Fairy and a drop of bleach. It is every bit as lovely as i thought it would be. I then realised it was similar to a few dishes that i had bought over the years - i had never checked the bases on any of these items to check for a makers name. Hence my new found love of Fosters Pottery - what a joy to find items on eBay too. I have just bought a 6 cup coffee set with saucers - i am so happy with it. Next on my list shall be the sugar bowl and jug/coffee pot. Has been so interesting to read peoples stories and to find out the history of Fosters. Hi I have a number of Fosters pottery Items for sale brown honeycombe teapot cakestand plates dishes oval dinner plates toast rack butter dish and a wine carafe and goblets plus more mugs cups etc Please email [email protected] to make me an offer North Cornwall. Fosters pottery has been part of our life for about 30 years now and my husband and I are still finding odd items we have not seen before to add to the collection. It may surprise some that besides the vast amount of kitchen ware they also produced many ornaments as well. In our collection at least 3 different size teapots and 3 different coffee pots and 4 different types of mug. There are many animals cats dogs horses ducks frogs etc, also table lamps and at least 4 vases of different shapes and sizes and flower pots. When I have more time I'll try compiling a list. Be sure to send me your pics when you have time, and I'll add them to your post. Eat your hearts out Fostwes collectors. I have a minature Fosters Toilet!!!! Today at the Kent county antiques show I purchased two large pieces of troika by fosters pottery ltd. " A celebration of Troika Cornwall "& GJ on the base.. Are these pieces genuine troika !!??.. Is this the same ....ie Gypsy Pottery & Mike Foster ? I have a mortar and pestle .....for sale a blue glaze ...lovely piece.